Please see the program website for a detailed schedule and abstracts of the talks. On Wednesday evening, we will have a guided tour through the exhibition of the Horst Janssen Museum and thereafter enjoy a nice dinner (served from a buffet covering a variety of food including vegetarian dishes) at the museum's restaurant. The social event is of course covered by the registration fee. A very limited number of extra seats is available. Please contact us for details if you are interested. Note that there is another PhD school with slight thematic overlap which takes place only 10 days before: the ARTIST Design - MT-LAB school on Quantitative Model Checking in Copenhagen, Denmark. To participate in both events should be especially interesting for students coming from far away. The focus of the ARTIST Design - MT-LAB school is model checking of systems with quantitative information. The spring school will be held at the Carl von Ossietzky University Oldenburg, campus Wechloy (location in google maps, OpenStreetMap). By taking the buses of line 306 (see below for transportation in Oldenburg) to their final stop "Carl von Ossietzky Stra�e / Universität", you will easily reach the main entrance of the university campus in Oldenburg Wechloy. From there, we will make sure that a lot of signs will guide you the way to the front desk of the spring school and the lecture hall. From Monday to Thursday, all lectures will take place in W1-1-161, "großer Hörsaal", the largest lecture hall in the Wechloy campus. Only on Friday, we will have the lectures in room W1-0-015. During the spring school, we will have room W4-1-172 available e.g. for internet access or reading. From within central Europe, you can reach Oldenburg by train. In order to find your connection, use the website of DB (Search for train connections) and enter "Oldenburg(Oldb)" as your destination. Be careful not to travel to Oldenburg(Holst)! For many connections within Germany you can also directly buy a ticket online and print it out (it is then valid only in connection with an identification card, that you selected during purchase). This is also possible for some international connections, however, not for all of them. In Germany you can also buy tickets at automatic vending machines and counters in virtually every station. Otherwise, please use the services offered by your travel agency. The closest international airports are Bremen (BRE), Hamburg (HAM), and Hannover (HAJ). Once there, you can use the train to get to Oldenburg (Search for train connections, you can directly enter the airport identifier as the point of departure and again Oldenburg(Oldb) as destination) or a taxi (which can be very expensive!). If your flight is scheduled to arrive late at night or early in the morning, pay special attention to limited train services at those times. Oldenburg can also be reached by international bus lines (eurolines), however, connections are far more sporadic than those offered by trains. Unless you plan on renting a bicycle, using the city busses for getting around is probably the best option. 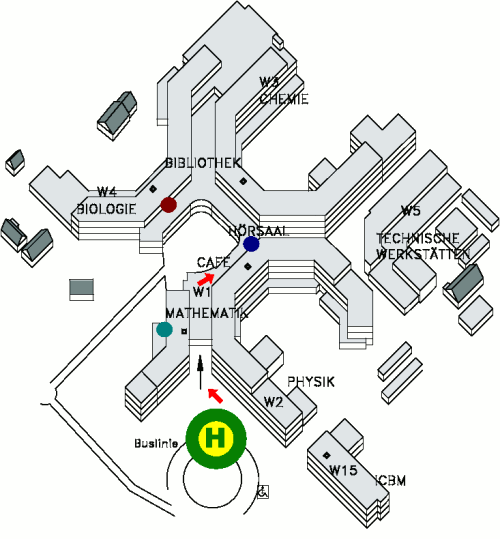 Campus Wechloy is located at bus stop "Carl von Ossietzky Straße (Campus Wechloy, Naturwiss. Trakt)". Busses must be entered through the front door and tickets always be shown to the driver. You can also buy a ticket from the driver by naming the destination stop. From all bus stops within the city, a ticket of "Preisstufe 1" (2.10 EUR) is sufficient (from some stops that are very close to the destination, a "Kurzstrecke" ticket would also be enough). There are different types of tickets that allow you to save some money depending on how intensively you use the buses. By selecting "Straße/ Hausr." instead of "Haltestelle" in the bus connection search forms, you can directly enter any address, e.g. also the one of your hotel. The result page will then also reveal the name of the closest / most suitable bus stop and even maps showing which way to walk to get there. We have reserved rooms in the following hotels. Please make sure to name "AVACS Spring School" when booking. A substantial number of options have already expired, so please make sure to book quickly! All prices are per night and per person including VAT. Please ask for a confirmation of the price when booking, as we have no influence on potential changes since the time when we requested the reservation option. Participants of the spring school can access the presentation material by using the username and password that have been announced on the spring school. You can either download individual presentations from the links that have been added to the program or download all slides in one archive. After having received more than 100 registrations, the online registration is now closed and we can no longer accept further entries to the waiting list. The participation fee is 80 EUR (approx. 117 USD) for early registration and 120 EUR (approx. 175 USD) for normal registration. Early registration was possible until 2010-01-31. Thereafter only normal registration was possible. The registration fee covers the lectures, course materials, and a social event including a conference dinner. A refund request received until 2010-02-15 is eligible for a refund of the fees with a 10 Euro cancellation fee. A refund request received after 2010-02-15 and until 2010-03-10 is eligible to a partial refund of 50% of the fees. There will be no refunds after 2010-03-10. On behalf of Oldenburg University, 1st-payment-portal.de (B+W Daten Service, Oldenburg, Germany) will charge the registration fee from your credit card. The account statement of your credit card will therefore list 1st-payment-portal.de (not Oldenburg University or AVACS Spring School). The online registration is now closed and we can no longer accept any further registrations. 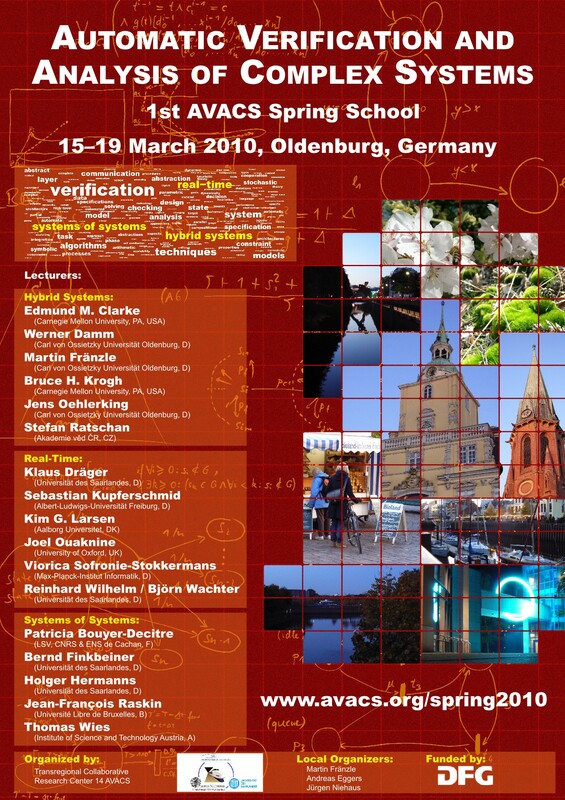 The 1st AVACS Spring School on "Automatic Verification and Analysis of Complex Systems" is organized by the large scale transregional research center AVACS, funded by the Deutsche Forschungsgemeinschaft DFG.